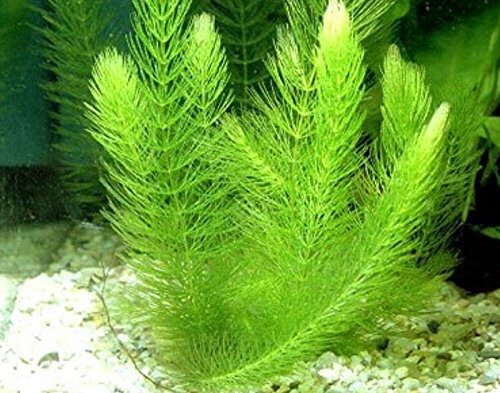 Hornwort, also known as Ceratophyllum demersum, is a floating plant with no roots (though it can easily be anchored in substrate). It is easy to grow and is fine with low-light setups, although more light means faster and denser growth. It grows by absorbing waste including ammonia and nitrates from the water. Due to variations of each plant, your item may not look identical to the image provided. Interested in a Large Quantity?? Drop us a message so we can make a special order!! I will give all buyers a 2 hour window to email me with any DOA's. Any problems after that, I can not be held responsible for. If the Plants was delivered while you were at work, and sat in your mailbox or on your porch till you got home, I am not responsible for the death of the Plants . So please make arrangements for a person to be home, or a safe place out of the sun and cold. I give you 2 hours after delivery to report a death to me in order for me to replace the Plants with equal quality Plants or a refund of the price of the Plants. I do not refund shipping costs. If the Plants are dead on arrival, I will need a email from you within 2 hours and pics of the Plants still in the bag. I then may ask for pics of the Plants out of the bag.